I'm not much of a hard cider drinker these days. When I was in college, I found it to be a nice alternative to beer, which I really didn't have much of a taste for. But eventually I saw the error of my ways and ditched the cider in favor of a good IPA. I do think the idea of hard cider as a cocktail ingredient is a pretty intriguing one. 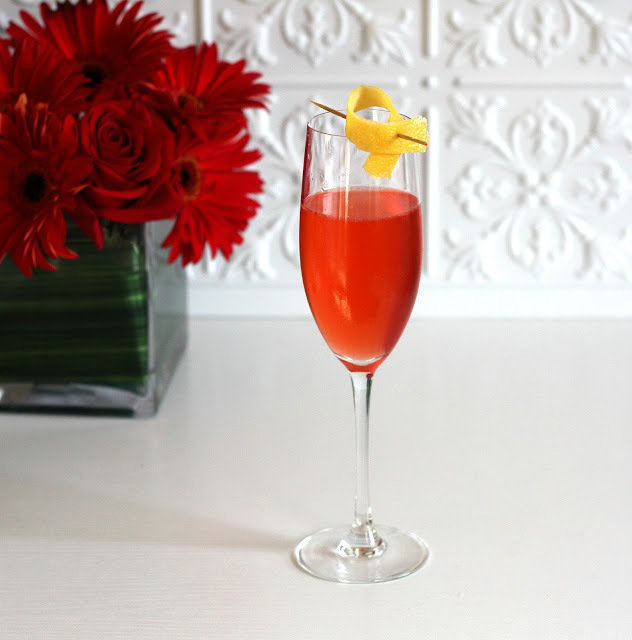 It's got the fizz and sparkle of champagne with a decidedly different flavor. And the Paris Between the Wars uses it perfectly. This lovely cocktail combines bitter Campari, rich Scotch, and sparkling hard cider with lemon and simple syrup. It's sweet, bitter, and tart all at once. Together the flavors are wonderfully rich. It's an elegant, unexpected cocktail that I'd happily make again and again. The flavor of this drink will definitely be influenced by the hard cider you use. I had a couple of bottles of Angry Orchard left over from a party, and while I still really enjoyed the cocktail, it's definitely optimized for a drier cider. If you're using something sweeter like I did, I recommend reducing the simple syrup a little. Or not - try it and see what you like! History: Isn't Paris Between the Wars such a wonderfully evocative name? This cocktail was invented by Abigail Gullo at Sobou in New Orleans, and I wish I knew how she chose the name. Whatever the reason, it's oddly fitting for this elegant, bittersweet libation. It turns out there are a few different versions of this recipe out there. This one from the Daily Meal uses more Scotch, honey simple syrup, and pear cider. And Sobou's menu replaces the Campari with Luxardo bitter. There's definitely some room to play around with these ingredients, but I like Imbibe's version below just fine. Combine all ingredients except cider in a shaker with ice and shake until chilled. Strain into a champagne glass. Top with cider and garnish with a lemon twist.